According to Smart Insights SEO statistics, there are over 3.5 billion searches per day on Google, which own 75% of all search traffic in the world (90% for mobile). Experts predict that by 2020, voice search will become a more common and require websites to be better optimized / structured. Forrester reported that over 90% of all Internet traffic comes from a search engine (though the search topic can originate from TV and other media sources). In other words, people hear about things, get ideas, or need to find something, and turn to search engines to get the information. At Social Web Tactics, we are fond of saying that search engines have become our answer engines. Human behavior supports that statement. A majority of all people use search engines to begin their search for information, even if they have some idea already of the source they are looking for. When there is not an immediate need present, consumers are more often prompted to search by a television commercial, social media, some form of digital out-of-home content, or radio. In other cases, searches are location-based, or prompted by a need for a service, food, activity or other something else that has more immediacy. The reactions are similar for business professionals and government decision-makers. 71% of B2B searches start off as generic searches, even when they are prompted by an advertisement, challenge or opportunity. On average, between 8 and 12 searches will be conducted before engaging on a specific brand's website (Google data from 2015 and 2014). If your website is not optimized for search, or performing technically well for search engines, you will miss on important organic traffic to your website. Direct traffic to your website is one of the most significant factors in where you rank in search engine results. This is followed by "time on site," "pages consumed by visitors by session," "referral traffic and backlinks," and lastly, "length of content." A detailed study from SEMRush, one of our strategic partners, has shown that the higher number for each of these elements is the most significant common factor in higher page rankings in Google search results (see chart below). There are, of course, two obvious facts to take into account when looking at that data. First, you cannot receive direct traffic if your website has technical problems that either prevent or limit it from being indexed in search engines. Second, people will not spend a lot of time on your website, view more pages, or link to your content if it is not optimized for how your audience searches for content and what they are looking for. Overview of our Search Engine Optimization (SEO) services. Click here to read "SEMrush Ranking Factors Study 2017 — Methodology Demystified"
A detailed analysis of your website's strengths and weaknesses, technical faults, and other factors is an essential starting point to improved ranking in search engines. A website audit (also known as an SEO audit) is designed to crawl through all the files, code, and content of your website, and provide an analysis of all the technical strengths and weaknesses that are present. And we are looking for any other elements that can create a bad user experience or create problems for a search engine's robots. The goal is to uncover anything that can impact those key ranking factors listed in the chart. The goals for conducting a site audit / SEO audit are important to keep in mind. Mainly, because once you have the results of your audit, you want to make sure that you are continually move towards accomplishing your goals, and prioritize tasks based on what is most important to your business or organization. It sounds basic, but the truth is that you want to start any website audit with the goal of finding all those things that can be impeding your success in search engines. Your primary goal should always be to improve your chances of being discovered online. Your next goal is once you have been discovered, you want your audience to find what you offer to be of value. If you achieve both those big picture things, you will see higher website conversion. The easiest ways to break down the goals for a website audit are to group what is learned into different categories, such as technical or content. Technical problems will be coding and script errors, slow loading pages, and other similar issues. Content is everything that addresses the target audience. The next way to break down your website audit is to group things by priority. You define what is a higher priority by the level of impact it will have on achieving your goals, and examining the level of effort it will take to accomplish it. For example, your website audit may come back with some minor technical problems and a huge number of toxic backlinks. The toxic backlinks (bad sites linking to your website) could prove to be both the most complex task, but also - the most important to fix. If you have two tasks that are about equal in benefit, you can prioritize by tackling the easiest of the tasks first, so that way you build positive momentum, and can start to improve your position in search results faster. As we have outlined above, there are compelling reasons to get your website audited, and repair the technical and content related problems that are preventing you from ranking well in search engine results. The technical pieces are often the easiest, because regardless of the complexity, you will know exactly what needs to be changed and how to change it. It often comes down to finding the right internal or external technical resource to make it happen. Content is a completely different story. 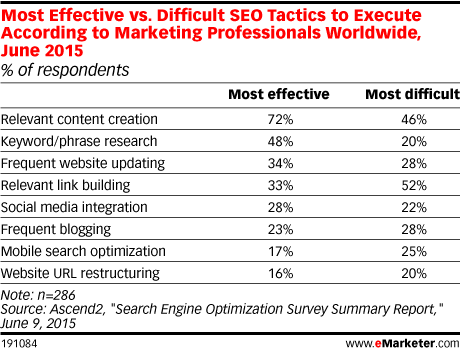 In a study done by eMarketer, more than seven in 10 respondents said SEO effectiveness got better, and that improving content value was what they perceived as the most important factor. As you can see from the chart below, 72% said it was the most effective, followed by keyword / phrase research (48%), frequency of website updates (34%), and link building (33%). However, it also was viewed as the most difficult (46%) to implement. Part of what makes optimizing content for search engines and audiences difficult is that it blends together a number of different disciplines within marketing. There is a creative element, and a need to be both strategic, tactical, technically knowledgeable, and an excellent writer who can build a bridge between all those pieces with words that are easy to understand. 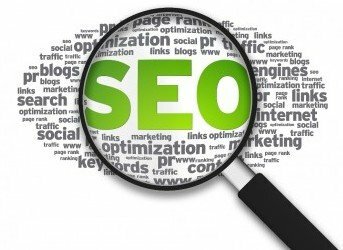 Search engine optimization is an integration of many things. Too often people try to over-simplify it, and not take into account many of the technical elements. Or people try to over-complicated SEO by thinking they can "game" or manipulate Google's algorithms to achieve higher page rankings. Other problems occur when an organization does not brace the importance of search engine optimization. This applies not just to senior leadership, but others within an organization or as part of a third party organization that is brought in for assistance. Believe it or not, we've actually encountered well-known web development companies that have not made SEO an important part of their design efforts. The truth is that SEO is not difficult - it can be learned and masted by anyone. But it does take time, research, and study. And it becomes very difficult when people try and work against the evolutionary core of what optimizing for search is all about: deliver the best answers to search inquiries, from the most structurally sound websites, to people quickly. So, how do you optimize content for online search? The first step is: create amazing, compelling, and highly valuable content. Though the content is not the only factor, how else are you going to capture direct traffic and encourage people to stay on your site, and engage with your content if you do not create something of interest? But how do you create amazing content that is relevant to your target audience? Take the search term "online homeschool curriculum" as an example. Homeschooling has grown in popularity in the U.S. By some estimates, there are over 2 million homeschoolers (3.5%+ of all school-aged children), and countless others not counted because they split time between homeschooling, tutoring, and traditional schooling. To reach the 1,300 people who search for "online homeschool curriculum" per month, you need to identify the competitors, and what additional topics parents are interested in as far as homeschooling is concerned. In the chart above, we can see a grouping of core industry competitors, and where they rank for this keyword / phrase in Google search. This allows us to access each page URL that is performing well to determine how the content is organized, what is written, and what kind of user experience is being provided. In this next chart, we can see all the keywords / phrases that are connected to "online homeschool curriculum," and use that information to build other, more targeted / niche content experiences. What the above chart also shows us is which terms are more expensive to run paid advertising for (CPC), and which terms are going to be easier to rank well for (KD score - the higher the number, the more different to rank well). 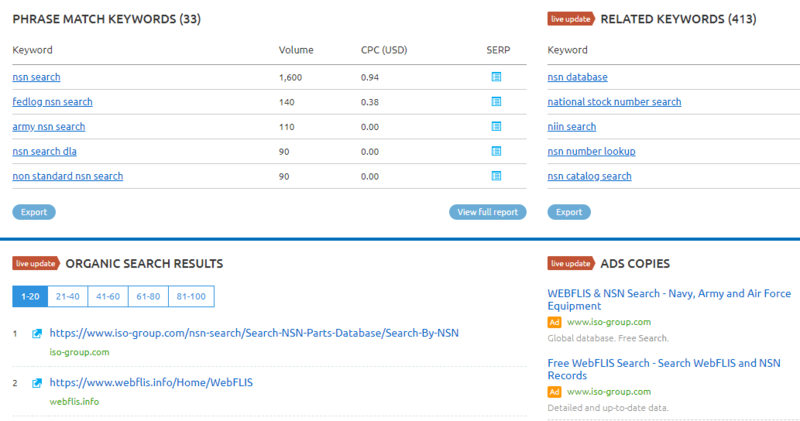 Looking at both sets of data, we can amass some blueprints on what performs very well in search engines, and then work to match it in an original way. By using our SEO tools, we can determine the pages that are performing well for high searched terms, and review how those pages are constructed, and what content appears on them. Knowing what works and what does not work in terms of content can help us to edit what exists on a website we are managing. This kind of website optimization is essential, because it has significant impacts to your business. In this post, we have outlined the importance of search to businesses selling to consumers, other businesses, organizations, and government decision-makers. Conducting an audit of your website is a tactical decision designed to improve your discoverability online. 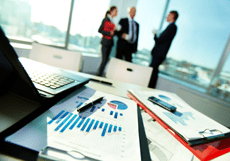 As we have outlined above, there are compelling reasons to get your website audited. Any technical errors that are harming your rankings in search engines will reduce the opportunities you have to connect with your target audience. Likewise, if your content is not well-written, or is not optimized for search engines and your audience, even if you are found online - you will not generate any engagement. Search engine optimization is critical to your business, because it combines the technical, creative, and revenue goals of your company into one field of expertise. And when done well, search engine optimization has the ability to increase organic traffic to your website, and improve customer conversions. Our team woud love to discuss your interest in a website audit and search engine optimization, as well as your business goals, in more detail. Please complete the form below, and one of our executives will contact you.